An update to Vol. 4, pp. 1257–1260. Ḥorvat ‘Eleq (Khirbet Umm el-‘Aleq) is located at the eastern edge of Ramat ha-Nadiv, c. 8 km northeast of Caesarea. The site is 7.5 a. large and lies at the top of a hill, 100 m above sea level (area C). At the foot of this hill is a small spring known as ‘En Ẓur (area A) with an outflow of 3–4 cu m per hour. 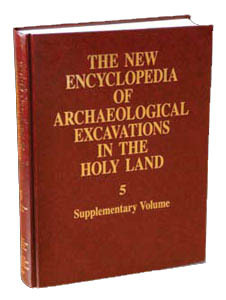 Excavations at the site took place in 1989–2002, under the direction of Y. Hirschfeld, on behalf of the Institute of Archaeology of the Hebrew University of Jerusalem. Five occupational strata were found. THE IRON AGE (STRATUM V). Roughly 140 Iron Age sherds were retrieved, most dating to the Iron Age I, in mixed loci at the top of the hill (area C), in the vicinity of the spring (area A), and on the eastern slope of the hill. A scarab dated to the beginning of the Iron Age was also recovered. It appears that Ramat ha-Nadiv belonged to the Dor district mentioned in the Bible ( 1 Kg. 4:11 ).